Last edited on March 17, 2019 by Timothy C. Hain, MD, Chicago IL. Paraneoplastic cerebellar degenerations are disorders of the cerebellum, the part of the brain responsible for coordination, which are associated with tumors (neoplasms). They arise when tumors express peptides/proteins that are normally found only in neurons, and it is believed that the immune system, in its attempt to kill the tumor, also damages the cerebellum. Only about 1% of all persons thought to have a paraneoplastic syndrome turn out to have antibodies to neurons (Pittock et al, 2004). Although antibodies are occasionally useful for diagnosis, they do not appear to be the cause of the cerebellar damage. Rather, current thought is that "killer T-cells", or cytotoxic CD8+ T lymphocytes, are the most likely mediator of neuronal injury (Yshii et al, 2016). Often a person who has one particular antibody also has others, suggesting that individual antibodies are not associated with individual conditions (Pittock et al, 2004). Treatments to reduce the antibodies are ineffective, and attempts to reproduce disease by transfer of antibodies into animals have been unsuccessful. Certain tumors are more commonly associated with antibodies than others. These include cancer of the ovary, uterus or adnexa, cancer of the breast, and especially small cell carcinoma of the lung. The condition frequently begins before the tumor is diagnosed. In children, neuroblastoma is a common cause of opsoclonus, thought to be a paraneoplastic syndrome. While of course different physicians might have different ideas about these things, we think it is best to look first for cerebellar eye signs, and do blood testing to see if paraneoplastic syndrome is a possibility rather than just send blood off in everyone. The reason is that blood testing using the Mayo paraneoplastic cerebellar degeneration panel, is wrongly positive 70% of the time. These blood tests are often falsely positive. A negative blood test has quite a high negative predictive value, but a positive blood test just a small positive predictive value (Ebright et al, 2018). This false positive rate, of course, depends on the referral patterns of the doctors who sent these blood tests to Mayo, but we think it is important to realize that a positive test does NOT necessarily mean you have this syndrome. Practically there are two distinct paraneoplastic syndromes that are mainly diagnosed by eye movements. Here the video-Frenzel goggles are essential. The so-called vestibulocerebellum consists of the flocculus, nodulus, and vermis of the cerebellum - -basically the parts other than the cerebellar hemispheres. As these damage to these parts of the cerebellum is accompanied by unsteadiness and nystagmus, without much clumsiness of the limbs, one of the paraneoplastic syndromes is attribtued to vestibulocerebellar disease. Downbeating nystagmus on lateral gaze. Recorded using an Micromedical Technology IR tracking system at Chicago Dizziness and Hearing. The vestibulocerebellar syndrome is usually dominated by a rapidly progressive unsteadiness, and downbeating nystagmus. The downbeating nystagmus can generally be seen without the need of Frenzel's goggles, but these are very helpful. Usually the downbeating nystagmus is increased on lateral gaze and convergence (see figure above and movies below), is relatively unaffected by head position, and is accompanied by poor pursuit. The main alternative disorder that closely resembles this picture is the Chiari malformation. A similar symptom complex can arise in persons who are ingesting cerebellar toxins (such as alcohol), in persons with tumors or masses in the midline cerebellum, and in patients with cerebellar degenerations. Movie of downbeating nystagmus in lateral gaze in case of paraneoplastic cerebellar degeneration (7 meg). Movie of downbeating nystagmus in case of anti-Yo paraneoplastic cerebellar degeneration. This video shows DBN similar with eyes open and closed (i.e. no fixation suppression). There is considerable gaze-evoked nystagmus without rebound nystagmus. Increase in nystagmus with convergence (7 meg). The MRI scan of the brain is nearly always normal. After eye movement examination and MRI, the single most useful clinical test is usually a chest X-ray, and if this fails to reveal a tumor, gynecological evaluation in women, a CT scan of the chest in either gender, and then a PET scan of the entire body. Pathological examination of these cases often reveals profound loss of Purkinje cells, which are the output cells for the cerebellum. Rarely, patients with the vestibulocerebellar syndrome have upbeating nystagmus rather than downbeating nystagmus. A similar case was reported by Wray et al. Upbeating Nystagmus in a patient with a renal mass. Recorded using an Micromedical Technology IR tracking system at Chicago Dizziness and Hearing. Image courtesy of Dr. Marcello Cherchi. In the past, the opsoclonus-myoclonus syndrome was often a paraneoplastic syndrome, but more recently it has become a common sporadic finding, possibly associated with the incursion of West-Nile Virus into the USA. Much more detail about saccadic nystagmus can be found here. Note that VNG test usually does not detect this syndrome -- because most VNG machines sample eye movements too slowly to see the rapid nystagmus of this syndrome - -it is diagnosed with the doctor's "eyeball". If your doctor or audiologist doesn't have good clinical judgement and experience, this can easily be missed ! The extremely rare paraneoplastic version of opsoclonus usually has no specific neuronal antigen marker (Bataller et al, 2003), but it is sometimes associated with anti-Ri antibodies. It is so rare, we could not find a video of it, but there are movies of opsoclonus in the page on saccadic nystagmus linked to above. We do not think it is always necessary to obtain anti-Ri blood testing -- as even if Ri is negative (as usual), one usually undertakes a search for cancer. In children, opsoclonus-myoclonus is sometimes also associated with neuroblastoma and viral syndromes, but recently, opsoclonus has become very common in all ages. The rise in sporadic opsoclonus may have simply drowned out the more pathological varieties. We are presently undecided about whether or not a PET scan is needed in all persons with opsoclonus, without an obvious lung tumor. In the past, we favored this policy, but it is almost never productive in the current clinical environment, due to the rise of sporadic opsoclonus. In even rarer cases where an autoimmune cause of opsoclonus can be identified, immunologic testing suggests that both B and T cells are recruited (Pranzatelli et al, 2004). Other cerebellar eye movement disorders can appear in the context of cancer. These are not nearly as specific as the two syndromes above. Macro-square wave jerks is occasionally a paraneoplastic syndrome. These are too-fro saccadic eye movements, that appear like a series of square waves on an ENG (see below). Macro Square Wave Jerks in patient with a cerebellar degeneration due to breast cancer. Note how the size of the SWJ increases markedly in the dark. There is also an upbeating nystagmus in the dark. This is a clearly excessive # of square wave jerks. Hu Small cell lung Anti-neuronal nuclear antibody-1 Sensory neuropathy, encephalomyeloneuropathy, gastrointestinal dysmotility. Not useful in following persons with paraneoplastic syndromes. amphiphysin breast and lung (small cell lung) neuronal cytoplasmic antigens. encephalomyeloradiculoneuritides, opsoclonus, stiff-man syndrome. Curiously, serum antibodies associated with cancer have become less useful as we learn more about them. They keep proliferating. In spite of hope to the contrary, serum antibodies add little to diagnosis and are not tightly associated with clinical findings. At this writing there are 9 described anti-neuronal antibodies associated with paraneoplastic syndromes. Certain types of antibodies are loosely correlated with certain disorders-- examples are anti-Hu and Yo. A review of these antibodies and their associations was published by Graus et al (2004). Anti-Hu is an type IIa, ANNA (anti-neuronal nuclear antibody) type I antibody. Small cell lung carcinoma is found in more than 80% of patients with anti-Hu. Generally anti-Hu is associated with a sensory neuronopathy. Hu has no value in following patients (Llado et al, 2004). Prostate cancer (which is very common), is occasionally associated with anti-Hu (Storstein et al, 2016). One would wonder how many of these are red herrings however. 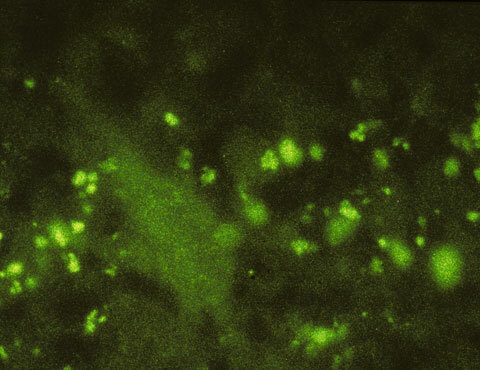 Anti-Yo is an anti Purkinje cell antibody. Anti-Hu reacts with nearly all neurons, but anti-Yo reacts only with Purkinje cells. Patients with anti-Yo have a gynecological cancer, usually ovarian or breast, 90% of the time. According to Venkatraman and Opal (2016), "the underlying mechanism is believed to be an immunological reaction to cerebellar degeneration-related protein 2 (CDR2), a protein usually found in the cerebellum that is ectopically produced by tumor cells." A second anti-Purkinje cell antibody (PCA-2) was described by Vernino and Lennon (2000). Anti-Ri, or ANNA-2, was first described in women with paraneoplastic opsoclonus and encephalitus associated with breast carcinoma. It also is found in men (about 1/3 of patients) and in association with lung cancer. Anti-amphiphysin antibodies can be associated with stiff-man syndrome, encephalopathy, and opsoclonus. (Wessig et al. 2003; Moon et al, 2014) Amphiphysin is a synaptic protein. Anti-TR, as of 2004 (Graus et al), is a poorly characterized anti-neuronal cerebellar antibody, found in patients with Hodgkin's disease. About 11% of the 28 patients described at that time had no tumor. Recent work has suggested that cytotoxic T cells are responsible for the damage to the cerebellar Purkinje cells (Albert et al, 2000). In this same study, a treatment with tacrolimus, a specific inhibitory of activated T cells, elminated cytotoxic specific T cells from the circulating blood. Other types of antibodies such as anti-GAD, and anti-gliadin antibodies found in celiac disease (Pellechia et al, 1999), are also associated with cerebellar disease. Arino et al (2015) discussed anti-GAD. Anti-GAD is associated with various "classic" paraneoplastic disorders such as limbic encephalitis, and occasional cerebellar degeneration and opsoclonus. Thus as usual, antibodies do not map to specific manifestations. Anti-GAD is mainly associated with stiff-person syndrome. Anti-Ma antibodies (Ma is a protein expressed in neurons, tumors and the testis) have also been associated with paraneoplastic brainstem encephalitis (Ma1 and Ma2), while immunity to Ma2 is predominantly associated with limbic and brainstem encephalitis (Rosenfeld et al, 2001; Ortega Suero et al, 2016). Anti-VGKC (voltage gated potassium channels) are sometimes associated with a variety of neurological symptoms, including paraneoplastic syndromes. The main paraneoplastic syndrome is Lambert-Eaton. anti-VGCC (voltage gated calcium channels) are also sometimes associated with cerebellar ataxia (Rigamonti et al, 2014). This report was not paraneoplastic as no tumor was found. Paraneoplastic cerebellar degeneration must be separated from numerous other causes of cerebellar damage. Treatment of paraneoplastic cerebellar degeneration. Greenlee (2013) commented that "Evidence-based treatment strategies for paraneoplastic cerebellar degeneration do not exist; and approaches to therapy are thus speculative." In short, the main treatment has been to remove the tumor. In persons whose tumor has been removed but continue to have ataxia, benzodiazepines are sometimes helpful (such as klonopin). For very severe conditions, immunosuppression is added (see below as well as the autoimmune brain disease page), but the response rate is very low. Regarding treating patients whose cancer is gone, but who have severe cerebellar disturbances, there is a logical issue here concerning treatment of conditions that have already killed neurons. Neurons, in general, do not regenerate, or "come back from the dead". Thus, treatments that "close the barn door after the cows are gone" -- i.e. immunotherapy after the tumor is removed, may be fruitless, or even damaging in as much as they are depressing useful immune surveillance systems. Concerning this idea, Yshii et al (2016) noted that CTLA4 blockade, a type of cancer immunotherapy, could induce a paraneoplastic syndrome in a mouse model. IVIG may be the exception, as it would be hard to see how extra antibodies could be harmful. Going back to the idea that treatment cannot restore dead neurons, Ayas et al (2016) commented that "Remission is only possible with the detection and treatment of the malignancy." Bekircan-Kurt et al (2015) comented that " Unfortunately, PCD symptoms do not improve with immunotherapy." Nonetheless, there are a sporadic reports of improvement, attributed to immunotherapy. Concerning anti-Yo, which probably reflects humoral immunity (rather than cellular), according to Venkatraman and Opal (2016), "Immunotherapies, such as steroids, intravenous immune globulins, and plasma exchange, have been extensively used in managing this condition, with limited success. The prognosis for anti-Yo PCD is almost uniformly poor, with most patients left bedridden." Tsuboguch et al (2016), based on a single case, stated "We propose an active treatment for anti-Yo-associated PCD consisting of tumor resection, combined chemotherapy, and IVIg.". Of course, this approach is not novel at all, and one wonders why these authors used the term "propose". This approach would seem most appropriate for patients with an acutely discovered tumor associated with anti-Yo. If we accept the idea that humoral antibodies are not the cause of cell death, but rather CD8+T cells (i.e. cellular immunity), one would think that treatments aimed at reducing the load of autoantibodies are either indirect or perhaps useless. Plasmapheresis with immunoadsorption is a method of reducing humor immunity. Gamma-globulin infusion is a method of "drowning out" potentially noxious antibodies with normal pooled antibodies. If cytotoxic T-cells are the culprit, one would think that treatment that reduces their effect would be helpful. For example Albert et al (2000) reported treatment with tacrolimus, a specific inhibitory of activated T cells, elminated cytotoxic specific T cells from the circulating blood. Greenlee (2013) commented that "Cyclophosphamide, tacrolimus, rituximab, or possibly mycophenolate mofetil may warrant consideration in patients who fail to stabilize or improve on less aggressive therapies." Moon et al (2014) reported improvement from anti-amphiphysin "syndrome" from IVIG, steroids, or rituximab. Most of their patients did not have cancer however. Arino, H., et al. (2015). "Paraneoplastic Neurological Syndromes and Glutamic Acid Decarboxylase Antibodies." JAMA Neurol 72(8): 874-881. Ayas, Z. O., et al. (2016). "Autoimmune neurological syndromes associated limbic encephalitis and paraneoplastic cerebellar degeneration." Neurosci Lett 632: 187-191. Bekircan-Kurt, C. E., et al. (2015). "Voltage gated calcium channel antibody-related neurological diseases." World J Clin Cases 3(3): 293-300. Graus F; Delattre JY; Antoine JC; Dalmau, J 4 and many others; Recommended diagnostic criteria for paraneoplastic neurological syndromes. JNNP. 75(8):1135-1140, August 2004. Greenlee, J. E. (2013). "Treatment of paraneoplastic cerebellar degeneration." Curr Treat Options Neurol 15(2): 185-200. Lopez-Chiriboga, A. S., et al. (2016). "Metabotropic glutamate receptor type 1 autoimmunity: Clinical features and treatment outcomes." Neurology 86(11): 1009-1013. Moon, J., et al. (2014). "Non-stiff anti-amphiphysin syndrome: clinical manifestations and outcome after immunotherapy." J Neuroimmunol 274(1-2): 209-214. Newsom-Davis, J. (2004). "Lambert-Eaton myasthenic syndrome." Rev Neurol (Paris) 160(2): 177-180. Ortega Suero, G., et al. (2016). "Anti-Ma and anti-Ma2-associated paraneoplastic neurological syndromes." Neurologia. Rigamonti, A., et al. (2014). "Non-paraneoplastic voltage-gated calcium channels antibody-mediated cerebellar ataxia responsive to IVIG treatment." J Neurol Sci 336(1-2): 169-170. Storstein, A., et al. (2016). "Prostate cancer, Hu antibodies and paraneoplastic neurological syndromes." J Neurol 263(5): 1001-1007. Tsuboguchi, S., et al. (2016). "A case of slowly progressive anti-Yo-associated paraneoplastic cerebellar degeneration successfully treated with antitumor and immunotherapy." Rinsho Shinkeigaku 56(7): 477-480. Venkatraman, A. and P. Opal (2016). "Paraneoplastic cerebellar degeneration with anti-Yo antibodies - a review." Ann Clin Transl Neurol 3(8): 655-663. Vernon S, Lenon VA. New Purkinje Cell antibody (PCA-2): marker of lung cancer-related neurological autoimmunity. Ann Neurol 2000:47:297-305. Wessig C, Klein R, Schneider MF, Toyka KV, Naumann M and Sommer C (2003). "Neuropathology and binding studies in anti-amphiphysin-associated stiff-person syndrome." Neurology 61(2): 195-8. Yshii, L. M., et al. (2016). "CTLA4 blockade elicits paraneoplastic neurological disease in a mouse model." Brain.